About this project: Dioramas are a wonderful way to create a fantasy art project. 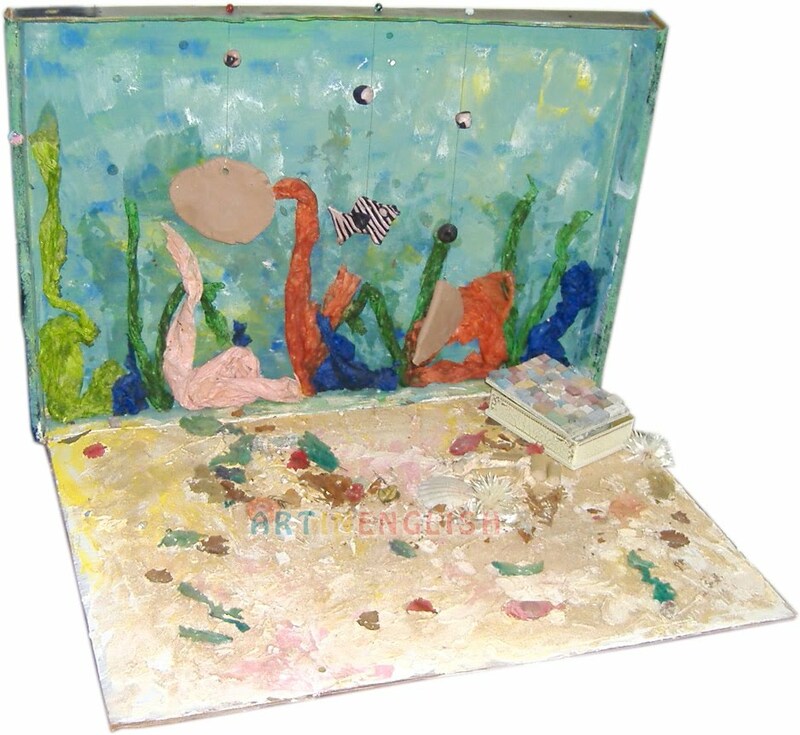 While creating this “Under the sea” diorama, students have the chance to paint, sculpt, decorate, build and make a 3-D collage. I like to begin this project by sharing the book The Rainbow Fish by Marcus Pfister and Alexander and the Magic Boat by Katharine Holabird. This is an art project that becomes an adventure! Twist tissue paper and glue to the interior of the box to look like a coral reef. Place a small wooden box on the bottom of the sea and decorate it to look like a treasure chest. Place a small treasure inside. Art Therapy Ideas The theme “under the sea” is a good way to create a fantasy adventure. Students can use their imaginations regarding an adventure, where the adventurers are going and what happens to them along the way. Who do they encounter? What is the weather like? What part is fun and what part is scary? Who would they like to take along with them on the adventure? I like to write down the stories they come up with. A good book to refer to is A Multi-Modal Approach to Creative Art Therapy by Arthur Robbins. Good luck including this art project in your art therapy practice. I think diorama art is a great way for children to express their creativity. An underwater scene is easy to accomplish and the kids will be so proud of their final masterpiece.